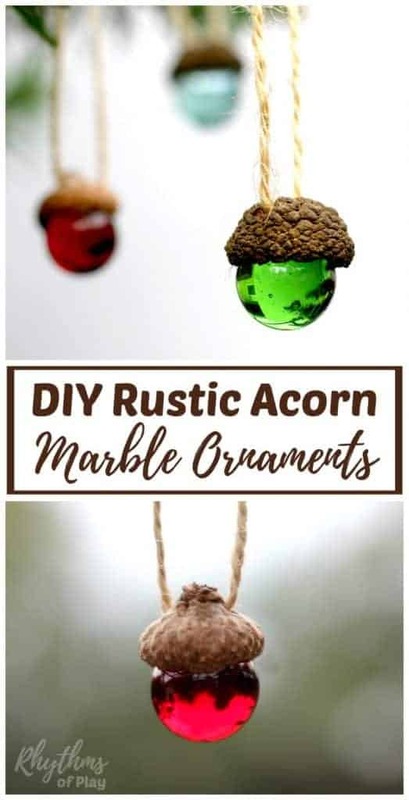 Handmade Rustic Acorn Marble Ornaments – These DIY Christmas ornaments make a wonderful Christmas craft and decoration that will add rustic holiday bling to your Christmas tree. 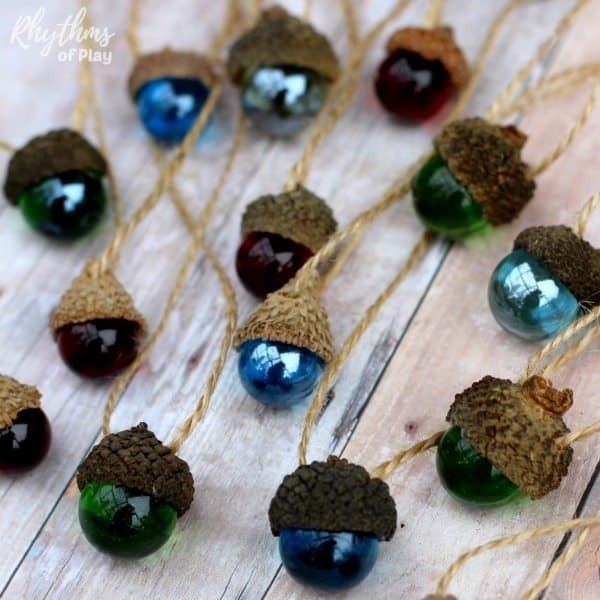 Homemade nature crafts like these acorn ornaments also make a great gift idea for kids to make! This fall, grab a few acorns and get started on your Christmas craft list! 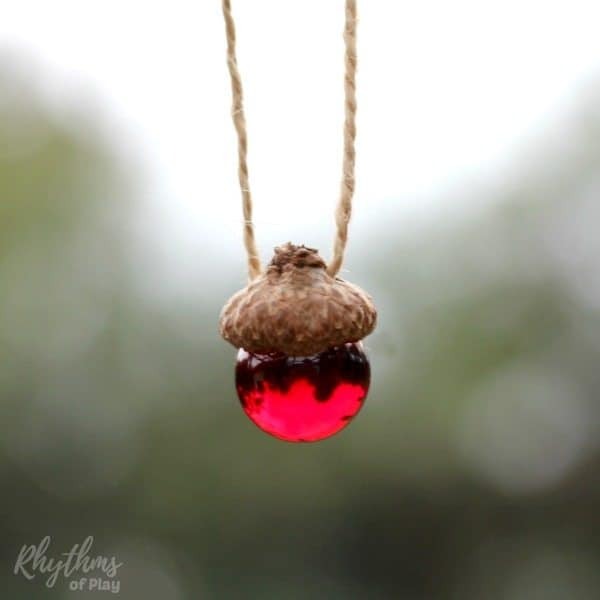 When my daughter and I made acorn marble necklaces we thought they would also look wonderful made into Christmas ornaments. Our tree looks gorgeous with the acorn ornaments with colorful marbles spread all about. Make these easy DIY Christmas ornaments with your children and add a little holiday bling to your Christmas tree! Marbles we used red , green , ice blue and clear . Step 1 – Collect acorns to make acorn ornaments. 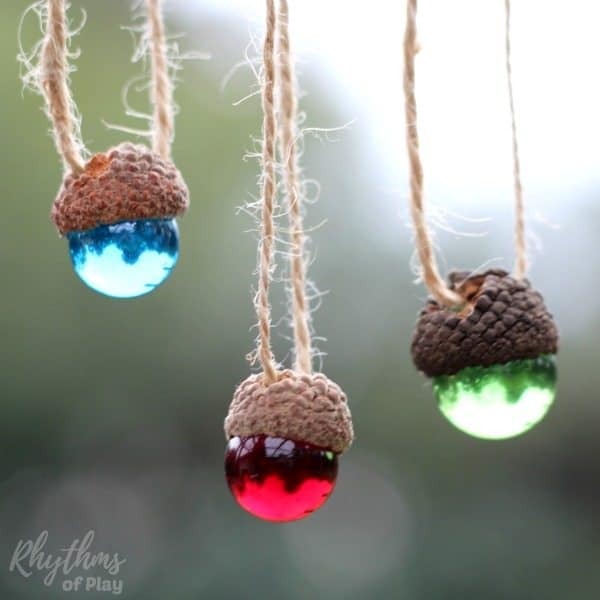 First, go on a nature hunt to find some acorn caps to make rustic acorn ornaments. If you can’t find any or live somewhere that Oak trees do not grow, you can find some acorn caps at THIS affiliate link. Play with your marbles and acorn caps to see which acorn caps will fit a marble. Not all acorn caps will work. Some acorn caps are too big for marbles while others are too small. Some large acorn caps will fit a shooter marble if you would like to make your acorn marble ornaments a little larger. There are several varieties of oak that grow near where we live. We had quite a stash of different types of acorn caps to make into ornaments. Just look at them all! Drill two holes into the acorn cap on either side of the stem, or where the stem was. See photos below. Cut as many 4 to 6 inch sections of twine as you need for the number of acorn caps and marbles that you have paired together. When we made our acorn necklaces we strung them so we could tie them to the length we wanted. In other words, the knot was outside of the acorn cap. For these Christmas ornaments, we opted to glue the knot inside the acorn cap of each acorn marble ornament so that they would look better on the Christmas tree. 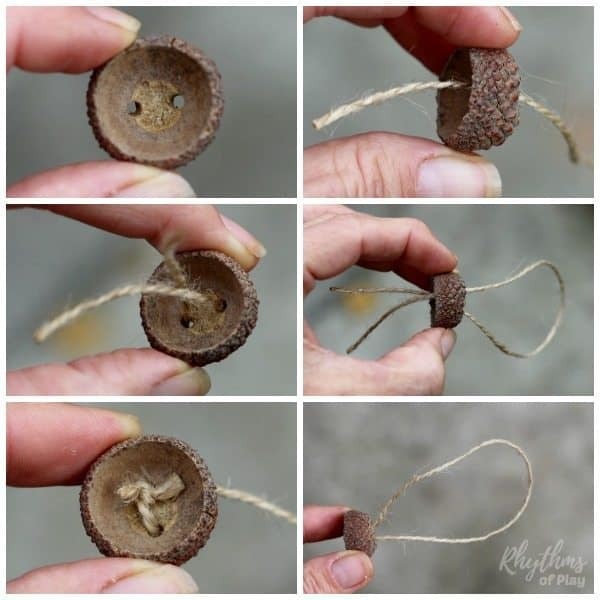 To do this, thread a 4 to 6-inch section of jute twine through the holes you pre-drilled into the acorn the cap and tie it together so that the knot is on the inside of the acorn marble Christmas ornament. We think shorter sections of twine look the best, but it really depends on the size and type of tree you will hang your acorn marbler Christmas ornaments on. For more photos check out our Acorn Marble Necklaces. Use a glue gun to place a dollop of glue inside the acorn cap and quickly place a marble into it before the glue dries. We have discovered that some marbles pop out over time when a glue gun is used. If you want to be sure that this does not happen I recommend you use E6000 Craft Adhesive. It is toxic, so please follow the manufactures directions if you choose to use it. We only use it outside and allow it to dry outside without any kids nearby. Safety first! 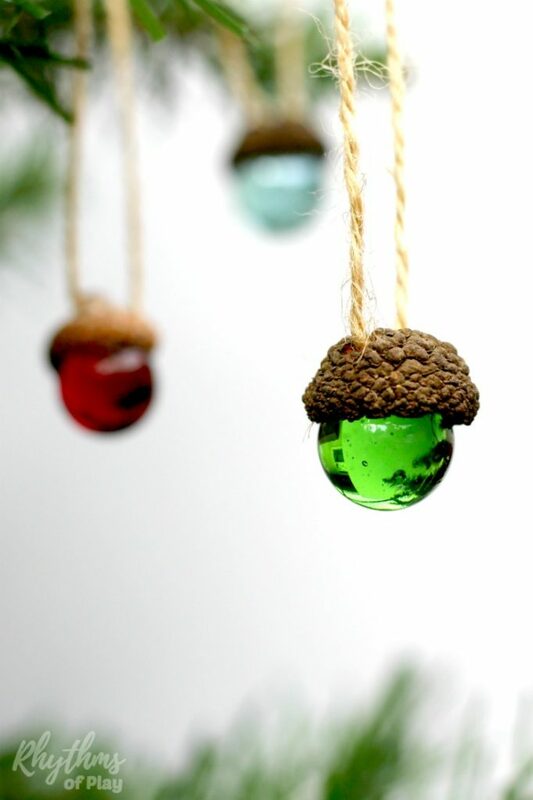 DIY rustic acorn marble ornaments make a wonderful Chrismas craft and decoration. Making homemade Christmas ornaments is an activity the whole family can enjoy together. You can find lots more ideas in 27 fun family Christmas traditions for a magical holiday. Handmade nature crafts like this also make a great hostess gift idea. Speaking of gift ideas, be sure to check out our Ultimate Gift Guide with DIY and ready-made ideas for the whole family! Be sure you pop over to check out all of our other homemade Christmas Ornaments… just click on the link to see them all! You might also like to see our winter bucket list seasonal activity guide. Hi there, what diameter marbles did you use? So sorry about the delayed response. We have linked to all the supplies that we used in the supplies section above. We used a combination of standard playing marbles you can find in the toy store and round translucent marbles commonly found in the floral department. Because acorn caps come in all shapes and sizes its hard to tell you which will work for you. Some acorn caps are too tiny for marbles, while others are too big, and a few are just large enough to fit a shooter marble. Use what works!